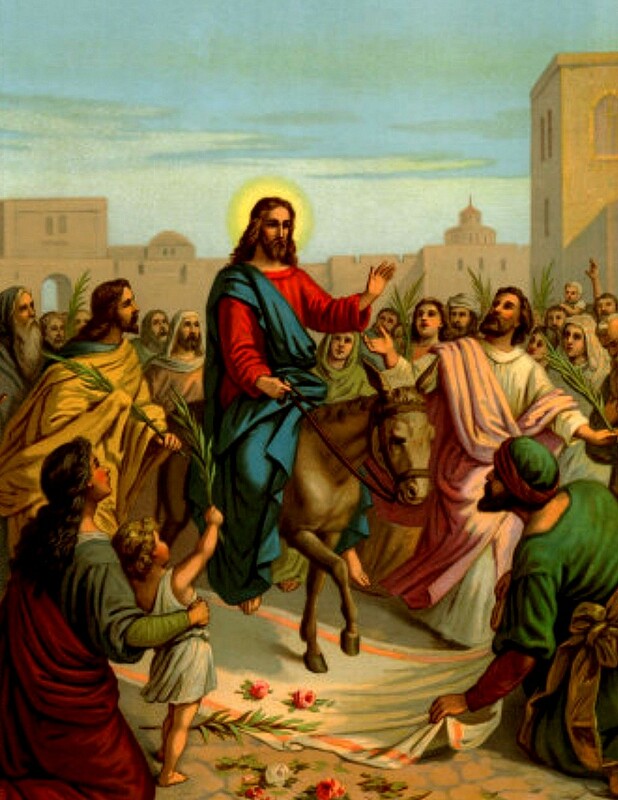 Double feast – Today is Palm Sunday obviously -Jesus’ Entry into Jerusalem. 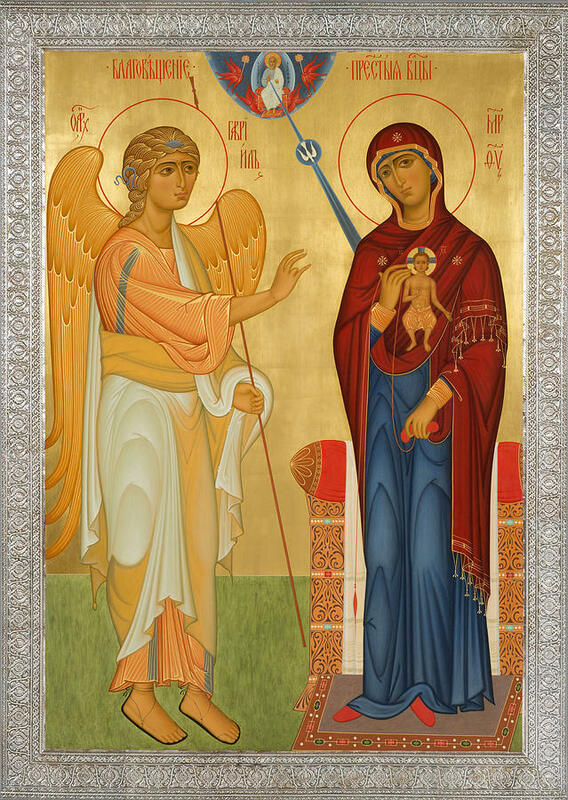 And also the Annunciation – which commemorates the day when Jesus is created inside the womb of the Virgin Mary through the action of the Holy Spirit. The key there in the whole episode of Gabriel coming to Mary is her Yes – Let it be done unto me according to thy word – Luke 1: 38. She says yes although she has absolutely no preparation for this – Jewish writings did not talk about the possibility of God becoming Incarnate in a woman – rather at the time they were looking for a royal messiah, a king to drive out the Romans and reestablish an independent and truly Jewish state, not the puppet kingdom of the Herodians who did not follow Jewish law. Her reply sets the entire event, all of world history from that moment on, into motion – Let it be done unto me. Why does that matter? In the 1st century world people worshipped many gods – but these gods could be nasty, even vicious. Their will was forced upon the worshipper, often with no regard for them. So despite claims by certain enemies of the Gospel that this the re-creation of a pagan story it is definitely not. Mary is asked – the Divine Office says that creation holds its breath waiting for her answer and rejoices when she says that wonderful verse. Without the Incarnation, there is no holy week, no passion, no resurrection, no Christianity whatsoever. The Logos, the Word, takes up residence in Mary’s womb while remaining in heaven as the 2nd Person of the Holy Trinity and Jesus exists: God and Man, united in one unique, never to be repeated Person, Who comes to earth in order to save sinful humanity from itself and restore the balance between God and mankind on the Cross. God becomes Man so that Man might become God in the womb of the ever-virgin sinless Mother of God. The entry – what animal does Jesus ride? The colt of a donkey, one which had never been ridden. First, it is a donkey, the most humble of animals, not a warrior’s horse, not a royal chariot pulled by beautiful horses , but a donkey, the same kind of working donkey that probably carried the pregnant Mary to Bethlehem 33 years earlier. And it has never had a rider -we know in the American West that if you try to mount a horse of any kind that has never felt weight on its back, there will be one heck of a negative reaction. The horse, donkey or mule will buck and toss, and fight against the strange feeling of pressure on its spine, and it takes a while to accomplish that task. Today in Roman rite churches the Passion narrative is read, with the priest, deacon and people taking different parts. The Eastern Churches look at Holy Week differently. We walk with Christ all week, day by day, experiencing His preaching, His cleansing of the temple, His prayers. We will be anointed with holy oil on Wednesday night for both physical and spiritual healing, just as the sinful woman anointed Christ with her tears and expensive ointment. We will be at the Last Supper, we will be at the betrayal, at the arrest in the midst of the camping pilgrims, His abandonment, at His illegal trial, His equally illegal torture, His unjust imprisonment, and finally at the first Way of the Cross and His Crucifixion. We will descend into darkness on Good Friday night and keep watch at the tomb with Mary Magdalene and the other Mary, as Saint Matthew recorded in chapter 27, and finally we will begin to anticipate the coming hope of His glory on Saturday night. It is the week of weeks, the days of days, the holiest most sacred time of the year. There are services here every night, plus during the day on Good Friday and Holy Saturday. Take the time out to pray, to think. Take time away from television, Facebook, smart phones, Snapchat and everything else to read what is happening in the Scriptures, to look at footnotes in Catholic Bibles and get the full impact of what’s going on. Take time on Good Friday night to come into the church in the dark to be with Jesus lying in the tomb, as Mary Magdalene and the other Mary did on that first Good Friday evening. Allow ourselves to confront our sins, our bad habits, our anger, our weaknesses and ask Jesus to strengthen us, heal us, lift us up. Take refuge in the pierced side of Jesus Christ on the Cross, like the doves that find clefts in the rock to rest it – take rest in Jesus’ five wounds. Do not let it be an ordinary week of commuting, studying, working, playing sports, goofing off. Pick up a good book from the church’s store today, one you’ve never read, and use it this week. 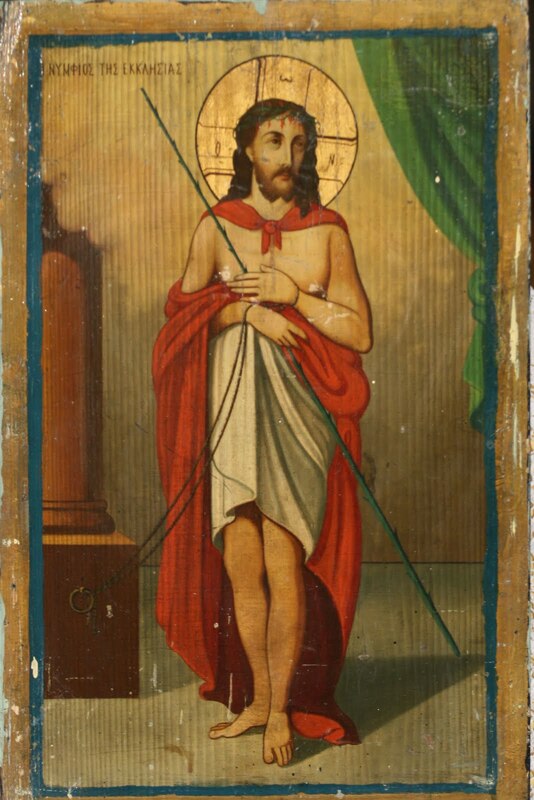 Above all, pray – pray that we as a parish walk with Jesus every step of the way; that we as a parish grow in faith and commitment to God and His Church, that we as individual souls get closer to Jesus through His self-giving this week of weeks, and find the healing that we need, including the healing we don’t even know we need. Let us walk with Him, walk with the Virgin Mary, walk with the holy women and St John who are the only ones to accompany Him, and ask His grace to move forward in our personal lives, and as a parish, and that His Precious Blood will truly wash away our sins, and the sins of this suffering world which has so much going crazy in it. Only in God do we find our answers, only in God will we find our peace, only in God will we know who we truly are and who we are meant to become.